The Sapphire JPG utility provides the Visual Studio developer with the ability to convert .bmp bitmap image files to .jpg JPEG files. Implementation couldn’t be easier, simply declare the DLL function as a function within your application and call it as though you wrote it yourself. 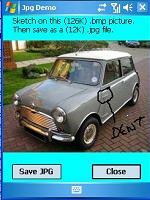 Here’s a sample demo to show how to save the bitmap file to a jpeg file.